Inge completed an MSc at the University of Oxford, and a research MPhil at the University of London, and then worked for industry and the University of Aberdeen in the UK, and for the CSIRO in Canberra. 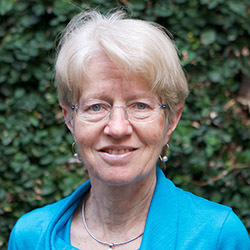 She completed a PhD in statistics at the ANU in 1991 on theoretical problems in image analysis. In 1991 she joined the University of Newcastle. From 2003 she taught statistics at the University of New South Wales, and she joined the University of Adelaide in early 2009. Inge’s research interests are in statistical learning and data science involving new statistical methods and theory for high-dimensional data and their applications in particular to proteomics and cancer research. She published the research and graduate text `Analysis of Multivariate and High-Dimensional Analysis’ with CUP in late 2013, and currently holds a part-time research-only appointment at the University of Adelaide. Inge has been passionate about encouraging young women to study mathematics and take up careers involving mathematics for many years, and she has conducted annual workshops for female high-school students and their teachers while at the Universities of New South Wales and Adelaide. Inge commenced her role as Executive Director for AMSI and for the Choose Maths program in mid-2015 building on her passion for engaging girls and young women in her love for mathematics.